The Loose Wire System is designed for use within the adhesive layer under tiles or within a leveling compound under other floor finishes. What project is the Loose Wire System designed for? The Warmup Loose Wire System (also known as DWSWire) is designed to suit irregularly shaped rooms and rooms with many fixtures, since the heating cable can simply be maneuvered on the subfloor around fixtures with ease. The spacing of the cable can be adjusted to your requirements in the desired power output and to the layout of the room you are installing the system in. The Loose Wire is ideal for installation under ceramic or natural stone tiled flooring. For regularly shaped rooms, Sticky Mat system offers a quick and precise installation alternative to Loose Wire. If you are looking to find an electric underfloor heating system to also protect the tiles, the DCM-PRO Heated Decoupling Mat is a practical solution for you. Alternatively, for floor finishes other than tiles, the Foil Heater System is the ideal solution as it does not require flexible tile adhesive or self-levelling compound; providing a completely dry structure upon which to install floorings such as carpet or laminate. The Warmup Loose Wire System (also known as the DWSWire) is designed to suit irregularly shaped rooms and rooms with many fixtures since the heating cable can simply be maneuvered on the subfloor around fixtures with ease. The spacing of the cable can be adjusted to your requirements in the desired power output and to the layout of the room you are installing the system in. The Loose Wire is ideal for installation under ceramic or natural stone tiled flooring. At only 1.8mm, the heating cable is the thinnest on the market – so it does not raise the floor height visibly. The small cross-section of the heating element allows it to be installed without the need for a layer of a self-levelling screed. Install a Loose Wire System with a tile adhesive layer under tiles or with a self-levelling compound under other floor finishes. Since installing Loose Wire does not require self-levelling screed, you do not lose any additional time or costs related to the drying of the system. Once the cable is laid down, the floor finish can be installed on top of it. The Warmup Loose Wire System is suitable for all applications providing primary or secondary heating in all rooms or projects that adhere to Building Regulations. Loose Wire is easy to install because it comes in the form of a kit. The kit contains all the necessary elements for the installation of the Loose Wire System. Note: Before beginning the installation of your Loose Wire heating system, please double check that you have the correct size and number of heaters for your project. If in doubt, please contact us at Warmup. At only 1.8mm, the heating cable is the thinnest on the market – so does not raise the floor height visibly. The small cross-section of the heating element allows it to be installed without the need for a layer of a self-levelling screed. Install a Loose Wire System with a tile adhesive layer under tiles or with a self-levelling compound under other floor finishes. 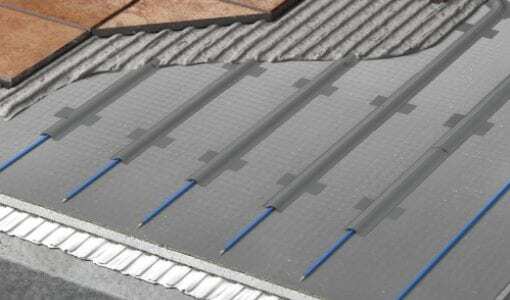 Since installing the Loose Wire system does not require self-levelling screed, you do not lose any additional time or costs related to the drying of the system. Once the cable is laid down, the flooring finish can be installed on top of it. Note: Before beginning the installation of you Loose Wire heating system, please double check that you have the correct size and number of heaters for your project. If in doubt, please contact us at Warmup.